So I just got back from a lunch with Jess Bentley (of Slice of Jess) at Sabor, a small restaurant inspired by Latin street food. 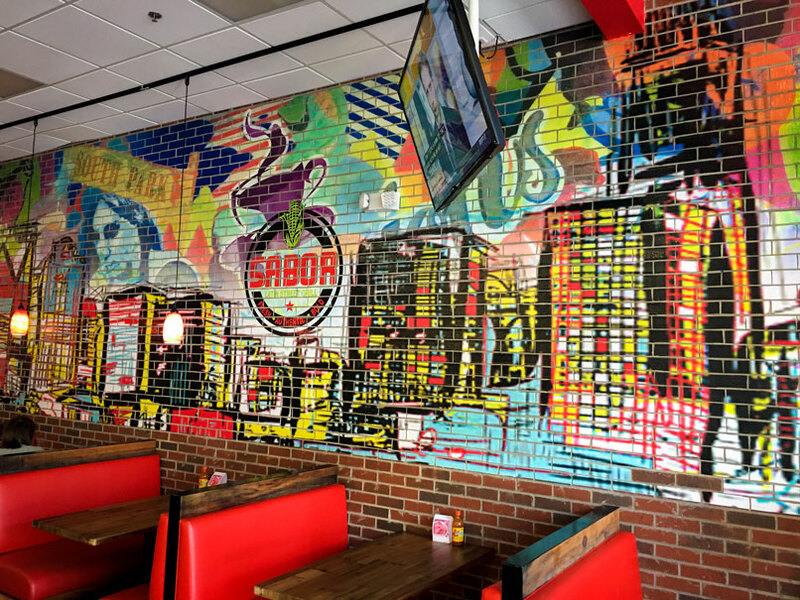 They have a handful of locations around Charlotte, but the General Manager, Pablo, invited us to the South Park location to get a cross-sectional view of their menu. If you want the polished, more pro-blogger version of this excursion (including the characteristically mouth-watering photo montage), check out Jess' finished piece here. If you look closely, you'll notice my blue plaid shirt in the background. I'm famous! Hey, Mom! Now, I’ll admit, this was the first time that I’ve been to a restaurant with a bona fide food blogger, and I was not fully prepared for the winking implication that accompanied the idea of “getting a cross-sectional view” of a menu. But for those who haven’t had such an experience, let me just say… at the time I’m typing this, I’m convinced that there’s a distinct market for food-blogger-approved stretchy pants. Pablo was mercifully patient in explaining their menu, as my limited knowledge of Latin street food was more flavored by Chipotle than streets in Latin America. Much of the menu was obviously pretty familiar (nachos, tacos, burritos, salads, etc), but I started stumbling when it came to knowing the difference between an arepa and empanada. They also have a cheekily-named “Heroic” menu section for those more concerned with their waistlines, which I eyed with particular interest (my own gustatory adventures have been building their own trophy case in my midsection as of late). 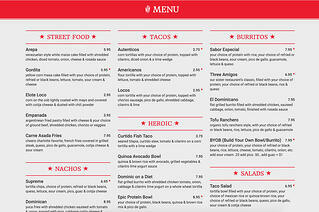 But… I had a menu cross-section view. Tomorrow is another day. How do you say “c’est la vie” in Spanish? First up, Elote Loco. As a rule, I’m a fan of anything on a menu that includes “loco,” and I’m happy to report that the elote was no exception. 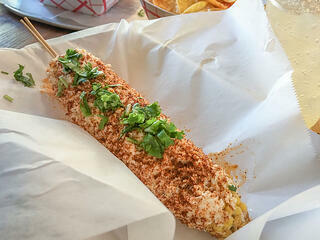 For the uninitiated, elote is corn on the cob… on a stick. Architecturally, there are few foods more structurally reinforced than these roasted kernels enrobed in mayo, cotija cheese and chili powder. A perfect starter, and you can use the leftover corncob and stick as a defense against anyone trying to get at the rest of your food. It was after the elote that the tide of dishes decided to rise. Or, to keep the street-related metaphors rolling, we hit rush hour. Arepa: a Venezuelan-style white maize cake (made in-house) filled with a protein. Ours was shredded chicken. When they say “cake,” they aren’t kidding. That one alone could keep me filled all day. Gordita: a yellow corn masa cake (made in-house) filled with protein (ground beef for us), beans, and your typical taco toppings. Probably the one menu item that felt totally familiar. Carne Asada fries: Exactly as the title suggests. It’s the food you crave when you’ve had 3 or 4 drinks and want something to share something messy and delicious with friends. As an aside, we did decide to do lunch right, with a Paloma (tequila, grapefruit soda and fresh lime juice) and a margarita. Hey, if you’re gonna go… get drinks, I guess. Curtido fish taco: tilapia diced small and pan-fried, which happily were perfectly moist and tender while still featuring the darker, crispy bits from the pan. That's harder to do than you might think. I’ve saved my favorite for last because I don’t want it to get lost in the mix of other delicious food. This will be my “ooh, if you go to ___, get the ___,” which is my favorite part of going to new restaurants. So if you go to Sabor, get the chorizo empanada. I’m a fan of chorizo in general, and I’ve found some great chorizo dishes in Charlotte. The chorizo torta at the Sav Way has even made my "death row meal" list, which is kind of a big deal. But the chorizo at Sabor is distinctly different than the bright-red, somewhat oily, kinda-sorta-like-pepperoni chorizo that I find myself eying lustfully at the Fresh Market as I fumble to hold my free thimble of coffee and cheese sample in the same hand. Sabor takes lean ground pork, then sprinkles it with magic. In this case, the magic comes from a dark spice mix that includes an intriguing under-current of cinnamon and allspice. Possibly clove, but even then, it was so light it might have just been my imagination. If you’re a chili fan, think the chorizo equivalent of Cincinnati-style chili, just without the cocoa. Or maybe they do use cocoa, I'm no chorizo chef. All that to say, their chorizo is awesome. Now put that chorizo in a perfectly-cooked puff pastry that’s roughly the size of your head. That alone would be worth the visit, but this savory empanada doesn’t reveal its true potential until dipped into the accompanying “pink sauce,” which of course is the deceptively-simple greasy food super-charger: mayo-ketchup. It is only then that you can feel that “well, I probably shouldn’t… wait, yes, yes I absolutely should, what the heck was I thinking” feeling that goes hand-in-hand with great street food. So if you’re in the South Park area, check out Sabor. 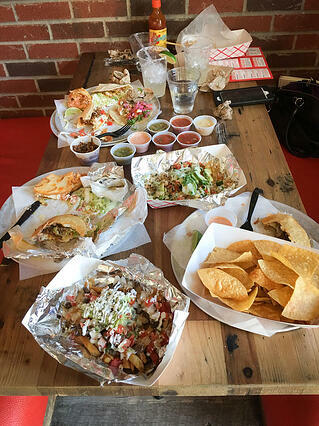 And, if possible, bring a food blogger… you won’t regret it. If you want more restaurant reviews and other useful blogging goodness, don't forget to subscribe to our blog. Also, check out Jess' blog for a smorgasbord of recipes that you can make at home.